SACRAMENTO, CA--(Marketwired - Jul 15, 2013) - Natoma Technologies, Inc., an innovative provider of information technology and software services, is pleased to announce that Jason March, Federal Practice Director, was selected by AFCEA International to receive the organization's Meritorious Service Award for outstanding contributions to the fields of communications, electronics, intelligence and information systems. "We are very happy Jason was recognized for his work with AFCEA and contributions to the federal information technology industry," said Marty McGartland, Natoma's founder and CEO. "His work to promote STEM education in the community reflects our core values of giving back to the community and encouraging kids to engage in technology early on." The Armed Forces Communications & Electronics Association (AFCEA) is a global professional organization dedicated to increasing knowledge through the exploration of issues relevant to its members in information technology, communications, and electronics for the defense, homeland security, and intelligence communities. With over 35,000 members worldwide and over 2,000 corporate affiliates, AFCEA is the leading professional association focused on the defense, federal IT, and intelligence industries. "Jason is well deserving of this recognition from AFCEA International. He started as a volunteer helping out with events, and quickly proved his capabilities and leadership. He advanced from volunteer to committee chair, and then went on to head our Young AFCEAN group. He is now a trusted member of the Board of Directors, responsible for chapter operations and future programs," said AFCEA NOVA Chapter President Chris Cusano. The Meritorious Service Award is given to AFCEA members who have demonstrated a sustained contributions to their chapter's education, professional development, and community service efforts. An AFCEA member since 2006, Jason currently serves as the Vice President for Chapter Affairs with the AFCEA Northern Virginia (AFCEA NOVA) Chapter and in 2012 was awarded the AFCEA International Emerging Leader award for outstanding contributions by members under 40. AFCEA NOVA is the largest chapter with over 7,000 members and 750 corporate affiliates and in 2012, awarded $140,000 in scholarship grants for students focused on science, technology, engineering, and math (STEM) educational fields. Jason was formally presented with the award during a ceremony held as part of the AFCEA Joint Warfighting Conference (JWC) that took place on May 14, 2013 in Virginia Beach, VA. Founded in 1998, Natoma Technologies, Inc. is an information technology consulting firm and systems integrator with a 15-year history of providing innovative software solutions to government and commercial organizations. Natoma is a privately-held corporation that focuses on making its clients successful via technical excellence and a collaborative team approach to deploy robust IT solutions that address specific business needs. For additional information, visit www.natomatech.com. 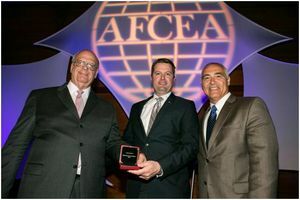 Natoma Technologies' Federal Practice Director, Jason March (shown center), receives AFCEA Meritorious Service Award.